Home » A STUDY ON PHYTOCHEMICAL COMPOSITION, GC-MS ANALYSIS AND ANTI-MICROBIAL POTENTIAL OF METHANOLIC LEAF EXTRACT OF ALSTONIA SCHOLARIS (L.) R. BR. A STUDY ON PHYTOCHEMICAL COMPOSITION, GC-MS ANALYSIS AND ANTI-MICROBIAL POTENTIAL OF METHANOLIC LEAF EXTRACT OF ALSTONIA SCHOLARIS (L.) R. BR. Department of Botany and Microbiology, Acharya Nagarjuna University Nagarjunanagar, Guntur - 522510, Andhra Pradesh, India. ABSTRACT: The present study was carried out to assess the various phytochemical composition, GC-MS analysis, and antimicrobial potential of methanolic leaf extract of Alstonia scholaris (L.) R. Br. by using different solvents. Phytochemical analysis revealed the presence of alkaloids, coumarins, flavonoids, glycosides, phenols, quinines, saponins, tannins, steroids and terpenoids. Susceptibility testing by Agar well diffusion assay showed significant antimicrobial activity with ethyl acetate and methanol extracts of leaves against bacterial strains such as Bacillus subtilis, Bacillus cereus, Pseudomonas aeruiginosa, Staphylococcus aureus, Escherichia coli and fungal strain Candida albicans. The methanolic leaf extract exhibited better antimicrobial activity than ethyl acetate extract. The UV-Vis, FTIR, and GC-MS have been employed to characterize the bioactive compounds present in methanolic leaf extract of Alstonia scholaris. The crude extract was scanned in the wavelength ranging from 200-900 nm by using Perkin Elmer Spectrophotometer, and the characteristic peaks were detected. The FTIR spectrum confirmed the presence of alcohol, alkanes, amides, alkyl aldehydes, halogen, and aromatic compounds. 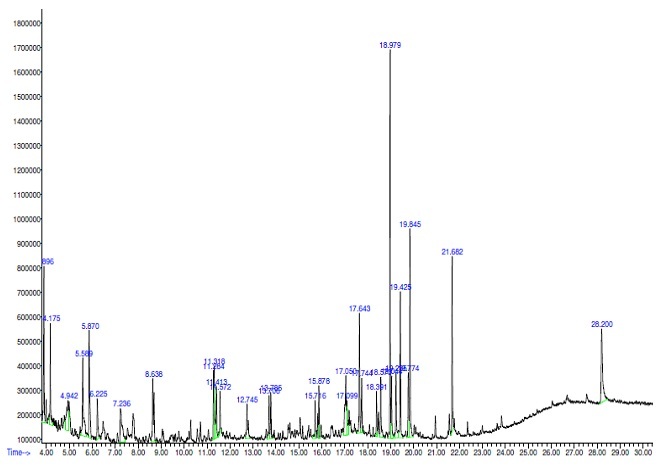 The results of the GC-MS analysis provide different peaks determining the presence of 9 phytochemical compounds with different therapeutic activities. The major phyto constituents were oxime-methoxy-phenyl, 2-methoxy 4-vinyl phenol, 2(4H)-Benzofuranone 5, 6, 7, 7a-tetrahydro-4, 4, 7a trimethyl, (-)-Loliolide, Neophytadiene, Hexahydrofarnesyl acetone, Phytol, 4, 8, 12, 16-Tetramethylheptadecan-4-olide, and Squalene. INTRODUCTION: The use of plants as therapeutic agents, in addition to being used as food, is age-long and there is a great awareness in the use and significance of these medicinal floras 1. Plants are a rich source of secondary metabolites with interesting biological activities. In general, these secondary metabolites are an important source with a variety of structural arrangements and properties 2. Natural products from microbial sources have been the primary source of antibiotics. But with the increasing recognition of herbal medicine as an alternative form of health care, the screening of medicinal plants for active compounds has become very significant 3. The active substances of many drugs found in plants are secondary metabolites 4 such as alkaloids, phenols, tannins, saponins flavonoids, terpenoids, glycosides and lactones 5. The phytochemical analysis of the plants is commercially very important and holds great interest for pharma industry which pursues the discovery of novel drugs for curing various diseases. This increased importance makes the study of phytochemicals, and bioactive compounds are inevitable 6. The knowledge of the chemical constituents of plants would further be valuable in discovering the actual value of folk medicines 7. The plant kingdom holds a great promise for medicinal substances in many plant species and still unexplored. Alstonia scholaris Linn. R. Br. (Apocynaceae) which is popularly known as the “Saptparni” or “The Devil tree” is an evergreen tree of the Indian subcontinent of South Asia and Africa. Different parts of the plant are used in medicines as antimicrobial, antihelmenthic, astringent, anti-periodic, diarrhea, dysentery, antimalarial and bowel disorders 8. Alstonia scholaris is one such plant showing multifarious pharmacological properties viz: diarrhea 9, wounds and earache 10, Leucorrhoea 11, dog bite 12, fever 13, malignancy, jaundice, hepatitis, malaria, skin diseases 14, astringent, thermogenic, cardiotonic 15 and antimicrobial activity 16. To validate the pharmacological properties of Alstonia scholaris, the present study was attempted to evaluate the phytochemical composition and the antimicrobial properties using various solvent extracts of leaf material. An attempt was also made to determine the bioactive compounds present in the Alstonia scholaris leaves with the aid of UV-Vis, FTIR and GC-MS techniques, which may provide an insight into the use of traditional medicine. MATERIALS AND METHODS: Healthy Alstonia scholaris plant with plant authentication voucher specimen number ANUBH01190 is selected in the Botanical Garden of Acharya Nagarjuna University, Nagarjunanagar, Andhra Pradesh (India). Fresh leaves were collected and thoroughly washed with distilled water to remove dust particles and subjected to shade drying at room temperature for about two weeks. Dried leaf material was powdered with the help of a mechanical grinder and sieved. Powdered leaf material (150g) was Soxhlet extracted with hexane, chloroform, ethyl acetate, and methanol for about 12-18 h. The crude methanol extracts were evaporated by a vacuum rotary evaporator (Buchi Labortech Ag, model l, R-215) under reduced pressure. The different solvent extracts were filtered and concentrated under reduced pressure in a rotary evaporator. The dried extracts were kept in the refrigerator at 4 °C until use. Preliminary Phytochemical Screening: Shade dried plant material was extracted with hexane, chloroform, ethyl acetate, and 80% methanol, and preliminary phytochemical screening was done by using the standard tests 17, 18. Alkaloid Test (Dragendroff’s Test): 2 ml plant extract was acidified with few drops of dilute hydrochloric acid. To this acidic medium, 1 ml of Dragendroff’s reagent (Potassium bismuth iodide) was added. An orange or reddish brown precipitate produced indicates the presence of alkaloids. Flavonoid Test (Shinoda Test): The presence of flavonoids was confirmed by treating the alcoholic plant extract with few fragments of magnesium ribbon and hydrochloric acid. The reaction mixture develops pink, scarlet or crimson red color, indicating the presence of flavonoids. Saponin Test (Foam Test): 1 ml of each extract shaken with 10 ml of distilled water and it was agitated in a graduated cylinder for 10 min. The formation of persistent honey-comb like froth indicated the presence of saponins. Quinone Test: A small amount of extract was treated with concentrated HCl and observed for the formation of a yellow color precipitate. Tannin Test (Lead Acetate Test): To 2 ml of each extract add a few drops of 10% Lead acetate were added. The appearance of white precipitate indicates the presence of tannins. Terpenoids and Steroids: 50% H2SO4 is added along the sides of the test tube containing a mixture of methanolic HCl and acetic anhydride. If there is any change in color, from green to blue-green (sometimes via red or blue) indicates the presence of terpenoids and steroids. Phenol Test: When 0.5 ml of FeCl3 (w/v) solution was added to 2 ml of rest solution, the formation of an intense color indicated the presence of phenols. Coumarin: To the methanolic extract, a few drops of alcoholic sodium hydroxide was added. Formation of yellow color indicated the presence of coumarins. Test for Glycosides: To the methanolic extract mixed with a little anthrone on a watch glass. Few drops of conc. H2SO4 was added and warmed gently over a water bath. The presence of glycosides was identified by dark green color formation. Resins: Plant extracts were treated with acetone. To this, a small amount of water was added and shaken. The appearance of turbidity indicates the presence of resins. Antimicrobial Activity: Nutrient agar (NA) was used for culturing the test bacteria. NA medium (100 ml) was sterilized at 15 lbs pressure (121 °C) for 15 min, cooled and inoculated with 0.1 ml of bacterial test suspension. After thorough mixing, the inoculated medium was poured into Petri plates under aseptic conditions. After solidification, wells of about 5 mm diameter were punched with a sterilized cork borer. Solvent extract (50 μl, 100 μl, and 150 μl) was added to each well, and the addition of solvent alone served as control. The inoculated plates were incubated at 30 °C, and the diameter of the inhibition zone was measured after 24 h.
Ultra Violet-Visible Spectrophotometry Analysis (UV-Vis): UV-Vis Spectrophotometer uses light in the visible ranges or its adjacent ranges. The color of the chemicals involved directly affects the absorption in the visible ranges. Molecules undergo electronic transitions in these ranges of the electromagnetic spectrum. Methanolic leaf extract was examined under UV visible spectrophotometry in the wavelength ranging from 200 to 900 nm using Perkin Elmer Spectrophotometer, and the characteristic peaks were detected. Fourier Transform Infrared Spectroscopic Analysis (FTIR): FTIR studies were done using Schimatzu IR Affinity - 1S spectrophotometer. The KBr used was of IR grade (SD Fines). About 500 mg of KBr was placed into a mortar and grind it until there is no evidence of crystallinity. The KBr powder was transferred into the drying box at a temperature of 400 °C. 10 mg of solid sample was placed into the mortar and again grind it until a fine powder is formed. One milligram of fine solid powder of sample (as per requirement of the die) and 200 mg of fine dry powder of KBr were weighed and the quantities were transferred into a mortar and mixed well with the help of a spatula. Bottom and the top portion of KBr were assembled at press assembly, and one of the 13 mm die with the polished surface up inside the press. The KBr sample mixture was transferred to a KBr press assembly. The sample was slowly compressed in KBr press assembly at a pressure of 2000 kg/cm2 for about 60 sec. The prepared disc was then subjected for scanning between 500-4000-1 cm. Sample Preparation: A 20 mg of sample was dissolved in 1ml of methanol, vortex for 5min, sonicate for 10 min, centrifugation (10000 rpm, 5 min), the supernatant was transferred into a fresh vial and was subjected (without any dilution) for GC-MS analysis. GC-MS Analysis: GC-MS analysis was carried out on a Perkin Elmer Turbo Mass Spectrophotometer which includes a Perkin Elmer Autosampler XLGC. The column used was Perkin Elmer Elite - 5 capillary columns measuring 30 m × 0.25 mm with a film thickness of 0.25mm composed of 95% dimethylpolysiloxane. The carrier gas used was Helium at a flow rate of 0.5 ml/min. 1 μl sample injection volume was utilized. The inlet temperature was maintained at 250 °C. The oven temperature was programmed initially at 110 °C for 4 min, then an increase to 240 °C. And then programmed to increase to 280°C at a rate of 20 °C ending with a 5 min. Total run time was 90 min. The MS transfer line was maintained at a temperature of 200 °C. The source temperature was maintained at 180 °C. GCMS was analyzed using electron impact ionization at 70 eV and data was evaluated using total ion count (TIC) for compound identification and quantification. The spectrums of the components were compared with the database of the spectrum of known components stored in the GC-MS library. Measurement of peak areas and data processing were carried out by Turbo-Mass -OCPTVS-Demo SPL software. RESULT AND DISCUSSION: In the present study phytochemical screening of the different solvent extracts like hexane, chloroform, ethyl acetate and methanol extract of leaves in Alstonia scholaris revealed the presence of various chemical compounds such as alkaloids, coumarins, flavonoids, glycosides, phenols, quinines, saponins, tannins, steroids and terpenoids Table 1. Phytochemicals may be effective in combating or preventing disease due to their antioxidant effect 19. The curative properties of medicinal plants are perhaps due to the presence of various secondary metabolites 20. The results obtained in the present study suggest that the identified phytochemical compounds may be the bioactive constituents responsible for the antimicrobial activity. Basing on the analysis of phytochemical composition in all solvent extractions, ethylacetate, and methanolic leaf extracts were selected for antimicrobial activity. The antimicrobial activity of ethyl acetate and methanolic extracts of the leaf of Alstonia scholaris were done using Agar well diffusion method. The zone of inhibition values was determined for ethyl acetate and methanol leaf extracts. The tested two extracts showed varying degree of antimicrobial activities at different concentrations. The ethyl acetate extract showed a zone of inhibition at maximum concentration (150 µl) against Pseudomonas aeruginosa (14 mm), Bacillus cereus and Candida albicans (13 mm) Table 2. Besides this, methanol extract showed good activity at same concentration against Bacillus cereus (21 mm) followed by Staphylococcus aureus (18 mm), Bacillus subtilis and Pseudomonas aeruginosa (17 mm) Plate 1A and 1B; Table 2. The present study is by Deepa 21 and Lakshmi 22 where the activity of methanol extract of leaves was found to be more pronounced than the ethyl acetate extract against selected microbes. 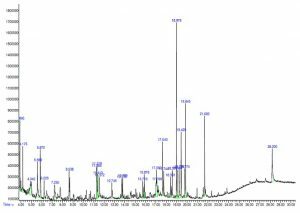 The qualitative UV-Vis spectrum profile of Alstonia scholaris methanolic extract was selected from 200-900 nm due to the sharpness of peaks and proper baseline. The profile showed the peaks at 665, 410, 336 and 277 nm with absorption 0.674, 8.478, 4.263 and 4.612 respectively Fig. 1 and Table 3. The result confirms the occurrence of peaks at 277-665 nm reveals that the absorption bands are due to the presence of phenolic and alkaloid compounds in Alstonia scholaris 23, 24. The FTIR spectrum was used to identify the functional group of the active components based on the peak value in the region of infrared radiation 25, 26. The results of FTIR peak values and functional groups were represented in Table 4. The FTIR spectrum profile as illustrated in Fig. 2. The FTIR spectrum peaks identified between 509 cm-1 - 3387 cm-1 confirmed the presence of various functional groups such as alcohol, alkanes, alkynes, amides, esters, Nitrogen, alkyl halide, halogen and aromatic compounds 27. The results about GC-MS analysis lead to the identification of a number of compounds from GC fractions of the methanolic extracts of Alstonia scholaris. They were identified through mass spectrometry attached with GC. 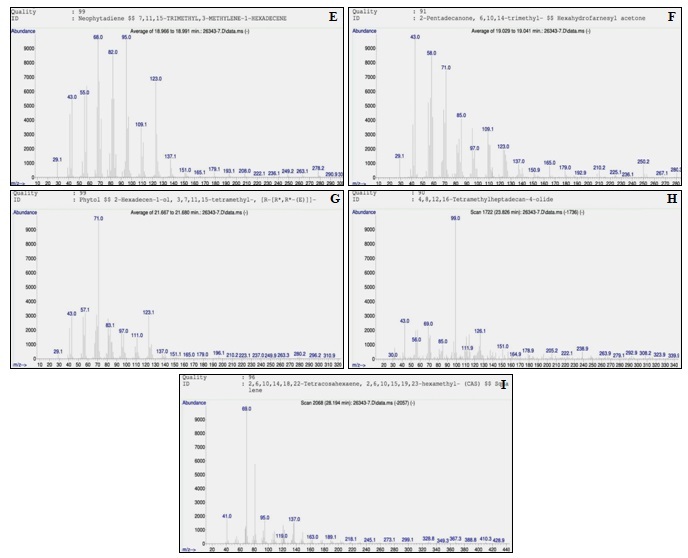 GC-MS is a key technological tool for secondary metabolites profiling in plant species 28, 29. The identification of the phytochemical compounds was confirmed based on the peak area, retention time and molecular formula were presented in Table 5. The mass spectra of all the phytochemicals identified in the leaf methanolic extract of Alstonia scholaris were presented in Fig. 3 and Fig. 4 (a-i). The GC-MS analysis of Alstonia scholaris methanolic leaf extract revealed the presence of major phyto-chemicals. The available phytochemicals and their biological activity were represented in Table 5. CONCLUSION: The present study concluded that the stronger extraction capacity of methanol could have been produced some active constituents responsible for many biological activities. The Alstonia scholaris has long been investigated for its phytochemicals and pharmacological activities supporting its vast ethnobotanical and alternative medicinal use. The plant has been reported extensively as an anticancerous, antimicrobial, molluscicidal, anxiolytic and antipsychotic agent. Therefore, it is recommended as a plant of phytopharmaceutical importance. However, the more spectral analysis must be carried out to evaluate the mechanism of action of Alstonia scholaris with different activities. Further, work is needed to isolate and identify these bioactive compounds which will pave the way for the venture of cost-effective drugs with fewer side effects. ACKNOWLEDGEMENT: Authors are wished to acknowledge Indian Institute of Chemical Technology (IICT), Hyderabad for providing GC-MS facility and Dr. R.V.V.S.N. Ravi Kumar, Department of Physics, Acharya Nagarjuna University for providing UV-VIS spectrophoto-metry, FT-IR facilities to carry out this work. CONFLICT OF INTEREST: Authors do not have any conflict of interest. Ali S, Nasreen S, Safeer S, Andleeb S, Ejaz M, Bano S and Shakir HA: Medicinal plants as therapeutic agents for cancer treatment. Punjab University Journal of Zoology 2016; 31(2): 295-305. Patel J, Reddy V, Kumar GS, Satyasai D and Krishna S: GC-MS Analysis of bioactive components on the leaves extract of Artocarpus hirsutus: A potential folklore medicinal plant. International Journal of Herbal Medicine 2016; 4(6): 95-97. DOI: 10.22271/flora.4(6): 95-97. Wink M: Modes of action of herbal medicines and secondary plant metabolites. Medicines 2015; 2: 251-286. DOI: 10.3390/medicines2030251. Cox PA and Balick MJ: The Ethnobotanical approach to drug discovery. Scientific American 1994; 270(6): 82-87. Pandey P, Mehta R and Upadhyay R: Physico-chemical and preliminary phytochemical screening of Psoralea corylifolia. Achieves of Applied Science Research 2013; 5(2): 261-265. Mojab F, Kamalinejad M, Ghaderi N and Vahidipour H: Phytochemical screening of some Iranian plants. Iranian Journal of Pharmaceutical Research 2003; 1: 77-82. Nadkarni AK and Nadkarni KM: Indian Materia Medica. Bombay: Popular Prakashan 1976; 1: 80-83. Khyade MS, Kasote DM and Vaikos NP: Alstonia scholaris (L.) R. Br. and Alstonia macrophylla Wall. ex G. Don: A comparative review of traditional uses, phytochemistry and pharmacology. Journal of Ethnopharmacology 2014; 153(1): 1-18. DOI: 10.1016/j. jep.2014.01.025. Singh H, Arora R, Arora S and Singh B: Ameliorative potential of Alstonia scholaris (Linn.) R. Br. against chronic constriction injury-induced neuropathic pain in rats. BMC Complementary and Alternative Medicine 2017; 17: 63. DOI 10.1186/s12906-017-1577-7. Manzur-ul-Kadir MM, Kadir MF, Hossan MS and Rahmatullah M: Medicinal plants of the Garo tribe inhabiting the Madhupur forest region of Bangladesh. American-Eurasian Journal of Sustainable Agriculture 2009; 3(2): 165-171. DOI: 10.22587/aejsa.2009.3.2.165-171. Khyade M and Kasote DM: Alstonia scholaris (L.) R. Br. and Alstonia macrophylla Wall. ex G. Don: A comparative review on traditional uses, phytochemistry and pharmacology. Journal of Ethnopharmacology 2014; 153(1): 1-18. DOI: 10.1016/j.jep.2014.01.025. Veerachari and Parashurama TR: Ethno-botanical health care knowledge in Harapanahalli. International Journal of Current Research 2016; 8(12): 42797-42801. DOI: https://doi.org/10.24941/ijcr.2017/8(12): 42797-42801. Mollik MAH, Hossan MS, Paul AK, Taufiq-Ur-Rahman M, Jahan R and Rahmatullah M: A comparative analysis of medicinal plants used by folk medicinal healers in three districts of Bangladesh and inquiry as to the mode of selection of medicinal plants. Ethnobotany Research and Applications 2010; 8: 195-218. Khanum S: Pharmacological investigation of the chloroform extracts of Alstonia Scholaris (L.) R. Br. Journal of Pharmaceutical and Scientific Innovation 2014; 3(1): 14-19. DOI: 10.7897/2277-4572.03198. Harborne JB: Phytochemical methods. A Guide to Modern Techniques of plant analysis, 1973; Chapman and Hall, London. Gibbs RD: Chemotaxonomy of flowering plants, 1974; Mc. Gill Queen’s University Press, Montreal. Halliwell B and Gutteridge JM: Free radicals, antioxidants and human diseases: Where are now? Journal of Laboratory and Clinical Medicine 1992; 119: 598-62. Stray F: The Natural Guide to Medicinal Herb and Plants. Tiger Books International, London 1998; 12-16. Philip D, Kaleena PK, Valivittan K and Girish Kumar CP: Phytochemical Screening and Antimicrobial Activity of Sansevieria roxburghiana Schult. and Schult. F. Middle-East Journal of Scientific Research 2011; 10(4): 512-518. DOI: 10.5829/idosi.mejsr. Kanthal LK, Satyavathi, K, Naidu AVR, Lakshmi NP, Sreekanth NP and Madhuri L: Pharmacological Potential of Lactuca runcinata DC: W Journal of Pharm and Pharmaceutical Sciences 2015; 4(3): 442-450. DOI: 10.20959/2015/4 (3): 442-450. 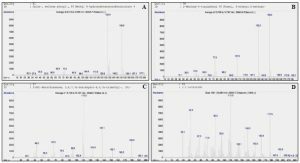 Karpagasundari C and Kulothungan S: Analysis of bioactive compounds in Physalis minima leaves using GC MS, HPLC, UV-VIS and FTIR techniques. J Pharmacognosy and Phytochemistry 2014; 3(4): 196-201. DOI: http://dx.doi.org/10.22271/phyto. Hawraz IMA, Ahmed AA, Faiq HSH and Giovanni V: ICP-AES, ICP-MS determination of elemental analysis of aerial parts and roots of Iris persica L. collected in Kurdistan Region/Iraq. Journal of Pharmaceutical and Scientific Innovation 2016; 5(3): 90-92. DOI: 10.7897/ 2277-4572.05319. Khalafalah AK, Yousef AH, Esmail AM, Abdelrazik MH, Hegazy ME and Mohamed AE: Chemical constituents of Tephrosia purpurea. Pharmacognosy Research 2010; 2(2): 72-75. DOI: 10.4103/0974-8490.62951. Manfred H, Meier H, Zeeh B, Lindon A and Murray M: Spectroscopic Methods in Organic Chemistry, 1997; New York: George Theme 365. Merlin NJ, Parthasarathy V, Manavalan R and Kumaravel S: Chemical investigation of aerial parts of Gmelina asiatica Linn by GC-MS. Pharmacognosy Research 2009; 1(3): 152-156. DOI: http://www.phcogres.com/text.asp? 2009/1/3/152/58/58128. Janakiraman N, Johnson M and Sathish SS: GC-MS analysis of bioactive constituents of Peristrophe bicalyculata (Retz) Nees. (Acanthaceae). Asian Pacific Journal of Tropical Biomedicine 2012; 2(1): S46-S49. Dahpour AA, Rahdari P and Sobati Z: Chemical composition of essential oil, antibacterial activity and brine shrimp lethality of ethanol extracts from Sedum pallidum. Journal of Medicinal Plants Research 2012; 6(16): 3105-3109. https://doi.org/10.5897/JMPR11.1270. Gopalakrishnan S and Vadivel E: GC-MS analysis of some bioactive constituents of Mussaenda frondosa Linn. International Journal of Pharma and Biosciences 2011; 2(1): 313-320. DOI://doi.org/10.22376/ijpbs. Yang WD, Liu YR, Liu JS and Liu Z: Inhibitory effects and chemical basis of Eucalyptus orelliana wood meals on the growth of Alexanrium tamarense. Huan Jing ke xue, 2008; 29(8): 2296-2301. DOI: 10.13198/j.issn.1001-6929. 0000. Yi Z, Yin-shan C and Hai-sheng L: Screening for antibacterial and antifungal activities in some marine algae from the Fujian coast of China with three different solvents. Chinese Journal of Oceanology and Limnology 2001; 19(4): 327-331. Al-Snafi AE: The medical importance of Cydonia oblonga - A Review. IOSR Journal of Pharmacy 2016; 6(2): 87-99. 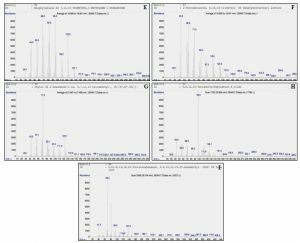 Hema R, Kumaravel S and Alagusundaram: GC-MS Determination of bioactive components of Murraya koenigii. Journal of American Science 2011; 7(1): 80-83. Syeda FA, Habib-Ur- Rehman, Choudhary MI and Atta-Ur-Rahman: Gas Chromatography-Mass Spectrometry (GC-MS) analysis of petroleum ether extract (oil) and bioassays of crude extract of Iris germanica. International Journal of Genetics and Molecular Biology 2011; 3(7): 95-100. DOI: 10.5897/IJGMB/ C10C17E2743. Zih-Rou H, Yin-Ku L and Jia-You F: Biological and pharmacological activities of squalene and related compounds: potential uses in cosmetic dermatology. Molecules 2009; 14: 540-554. DOI: 10.3390/molecules 14010540. 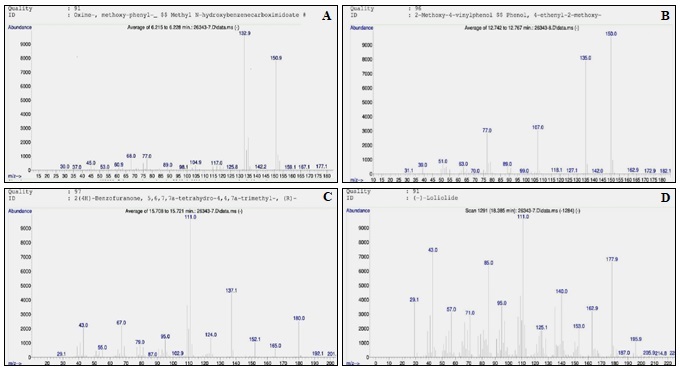 Swamy NT, Rosaiah G, Babu K and Kumar KV: A study on phytochemical composition, GC-MS analysis and anti-microbial potential of methanolic leaf extract of Alstonia scholaris (L.) R. Br. Int J Pharm Sci & Res 2019; 10(3): 747-55. doi: 10.13040/IJPSR.0975-8232. 10(3).747-55. Authors Address: Department of Botany and Microbiology, Acharya Nagarjuna University Nagarjunanagar, Guntur, Andhra Pradesh, India.